1. Admin & Employee Login separate features. 6. Flexible categories of Expense. categories can be created and updated at any time (full flexible categories that change everywhere with full functioning. 7. Easiest DBConnection with SqlServer. 8. Complete User Password security with Password Encryption & Decryption. 10. Prints Invoice after every Expense Created. 11. Receives Payments from Clients and Manages Balance. 15. View and track all expense and print slip at any time by One Click. 16. Upload and Download all type of image files or scanned copy of slip too. 18. 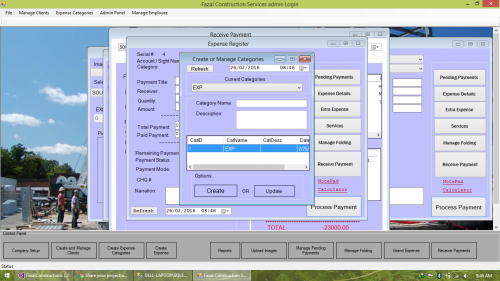 Creates and Manage Pending payments (advance) and generate reports and print slips every time transaction made. 19. Creates Services account in which pays money to Business partners and Track it with Reports and Flexible Parameters. 20. 10 types of flexible reports. Database script included in project.